Thoracic nerve root block is indicated for pain in the chest, including herpes zoster-related pain, thoracic radiculitis, and post-thoracotomy pain. The block procedure is commonly performed under X-ray fluoroscopy-guided method using either the frontal or oblique approach. While tracking the position of the inserted needle tip is easier with the frontal approach, this technique generally requires more advanced skills, such as sliding the needle along the underside of the transverse process of the vertebra. With the oblique approach, the needle can be advanced while checking the position of the tip relative to the lung under X-ray fluoroscopy-guided method, helping to reduce the incidence of pneumothorax. 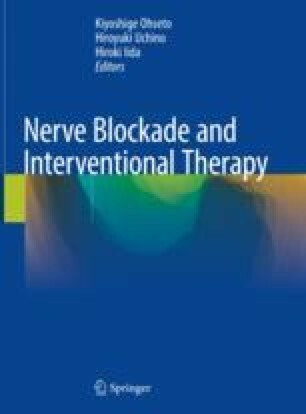 For long-lasting pain relief, neurolytic blocks using radiofrequency sympathectomy may be applied to thoracic nerve roots. In addition, the loss of resistance technique in which analgesic agents are not injected into the nerve itself, but rather distributed around the nerve root, is recommended as it is associated with less pain for the patient.